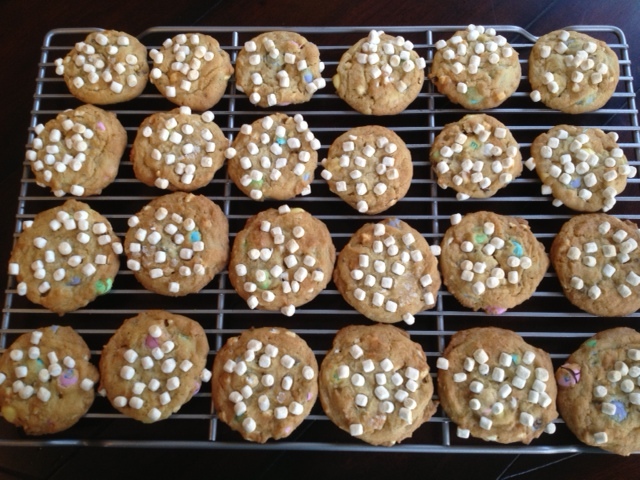 If you needed a cookie recipe for Easter, then I’m a day late and a dollar short – oops, sorry. Regardless, these cookies are great for any spring event…or if you just need a little bit of extra happiness in your day. I think it’s the teeny tiny marshmallows. They make everything a little more happy! This is a classic combination of spring flavors – chocolate and marshmallow. 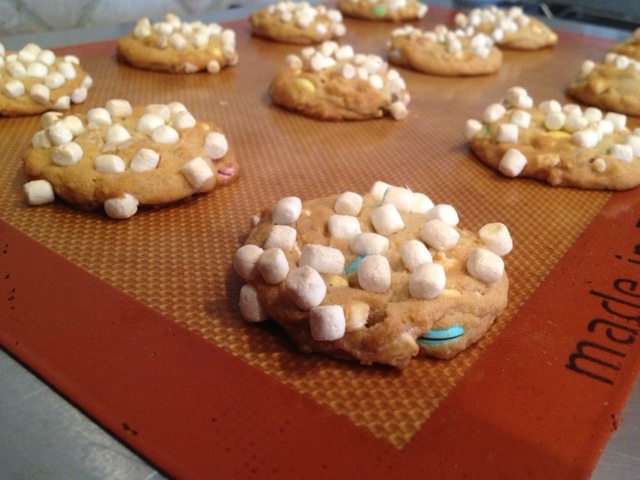 I used vanilla pudding mix (to keep them nice and soft), spring-colored M&Ms (although you can use any color you like), and marshmallow “bits”. These are the exact same marshmallows you’d find in your hot cocoa packet…or in a box of Lucky Charms cereal. I believe they are dehydrated which means they don’t melt and get sticky in the oven. If you’ve ever tried mixing marshmallows into cookie dough, you know what I’m talking about. It can be a horrible mess and cause your cookies to stick to the pan (even with a silpat liner or parchment paper) and fall apart. Not pretty – or happy. 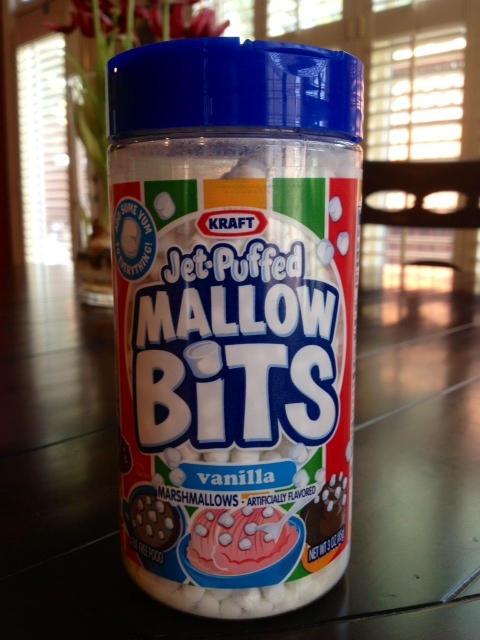 The marshmallow bits hold their shape but still give you that awesome marshmallow flavor. When I was scooping out the dough, I dunked each one into a plateful of the marshmallow bits so that when they baked, you could still see them on top. A nice side effect was that the bits took on a bit of a “toasted” flavor. As always, if you can’t find some of the ingredients (like the marshmallow bits) in your local grocery store, I recommend checking Target, Walmart, or Amazon. I’m already dreaming up other ways to use them! Stir in the M&Ms and 1 c. of marshmallow bits. If you have time, chill the dough for a few hours (and up to overnight) before scooping. Using rounded spoonfuls, scoop the dough and dunk each ball into a plate or bowl filled with the remaining marshmallow bits. 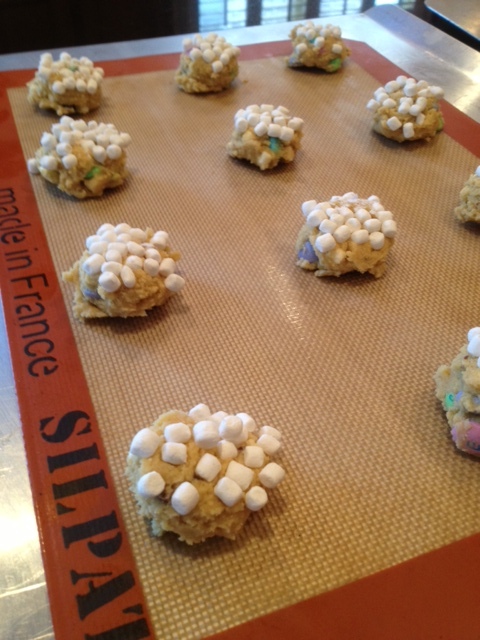 Place the dough balls (marshmallow side UP) onto cookie sheets that are lined with parchment paper or a silpat liner.